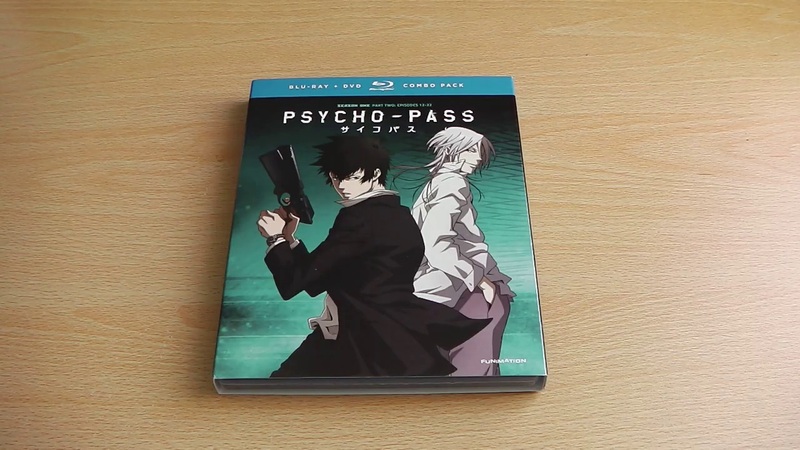 When FUNimation released Psycho Pass onto Blu-ray and DVD within America two different versions of the series were available, a limited edition premium set which contained the complete series with a variety of phsyical bonus content, and two half-season sets. 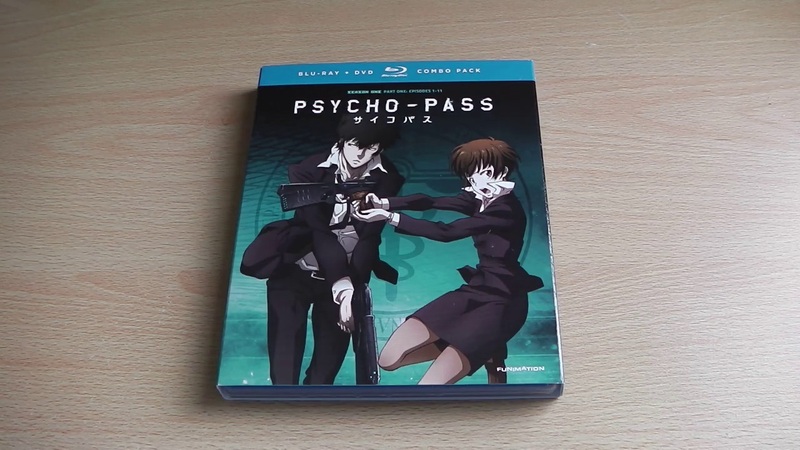 Well today i’ll be taking a look at one of those ‘half-season’ sets, namely Psycho Pass Series 1 Part 1. Plot: Some guys have no luck; he’s got no pulse. That’s life for unfortunate, undead Ayumu. First, he was murdered by a serial killer. Total bummer. Then he was resurrected as a zombie by a cute little necromancer. That seemed pretty cool until she moved into his house, refused to speak, and forced his rotting carcass to do all the cooking. After that, a magical girl in a pretty pink dress used her matching chainsaw to chop his corpse in half. 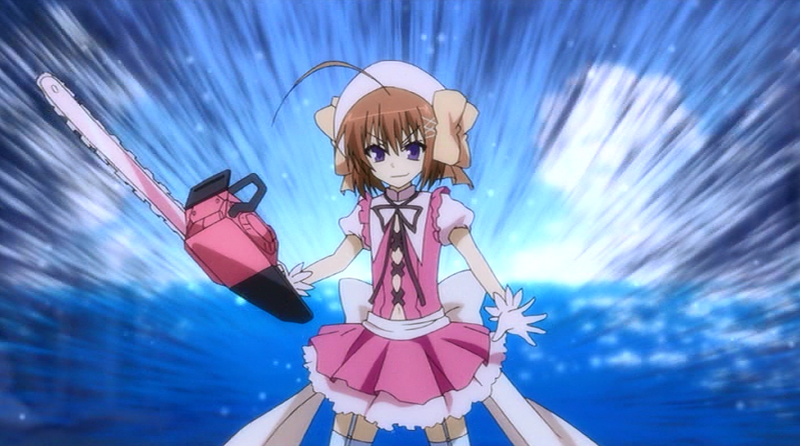 Luckily, the necromancer’s powers of resurrection trumped those of the chainsaw chick, so instead of dying (again), Ayumu became the world’s first magical girl zombie. There’s also a voluptuous vampire ninja who thinks zombie boy’s a pervert – and a hideous crayfish demon who wants to devour him. Confused? All you gotta know is this: zombies, frilly dresses, demons, and moe chainsaws. Pink. It’s the new dead. Ever wanted to see a Zombie combined with Magical Powers, No? 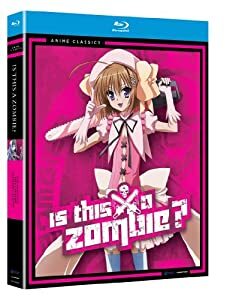 Well we are about to as ‘Is This a Zombie’ Season 1 is soon to arrive on UK Shores, but what exactly did we think of this DVD Release by MVM Entertainment? 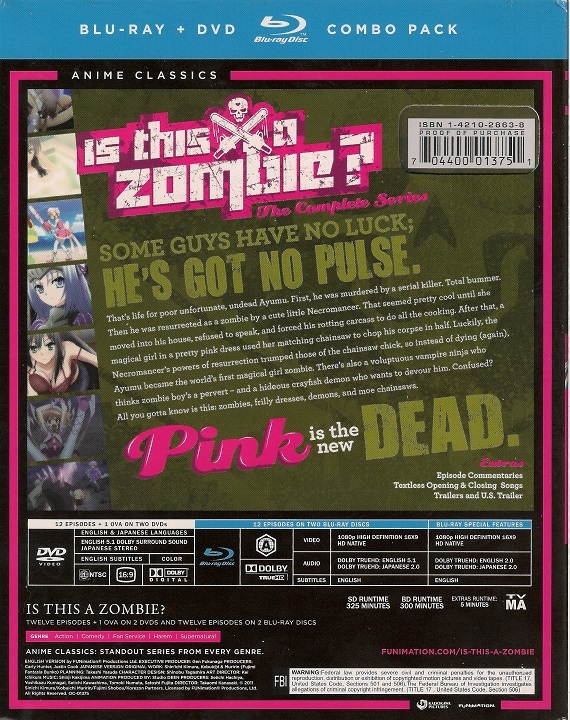 Find out in our DVD Review of Is This a Zombie – Season 1. Some guys have no luck; he’s got no pulse. That’s life for unfortunate, undead Ayumu. First, he was murdered by a serial killer. Total bummer. Then he was resurrected as a zombie by a cute little necromancer. That seemed pretty cool until she moved into his house, refused to speak, and forced his rotting carcass to do all the cooking. After that, a magical girl in a pretty pink dress used her matching chainsaw to chop his corpse in half. 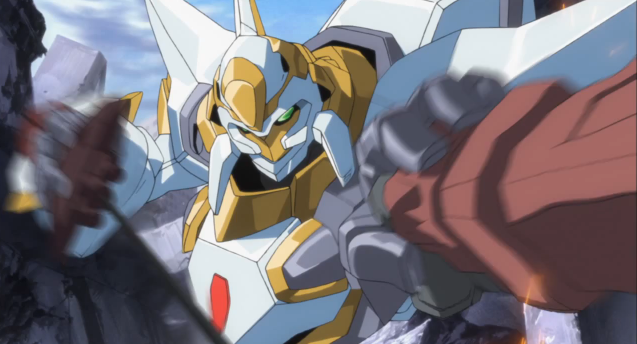 Manga Entertainment UK, in conjunction with Kaze UK, have today released trailer’s for two of their upcoming Blu-ray (and DVD) Releases, both of which are extremely popular titles. The first Blu-ray release is Code Geass Season 1, a release which was previously released in the UK on DVD by Beez Entertainment, however on the 21st January 2013, Manga UK & Kaze UK will re-release it on Blu-ray and DVD in complete ‘Series’ Boxset. 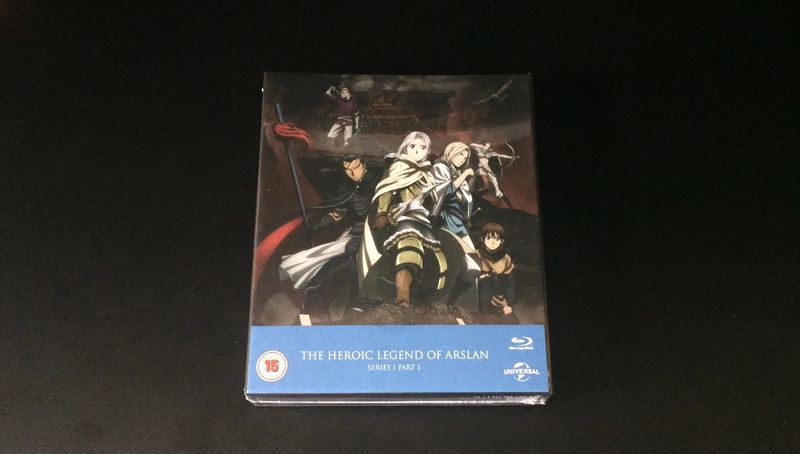 This Blu-ray release will feature all 25 episodes over 2 Blu-ray Discs. 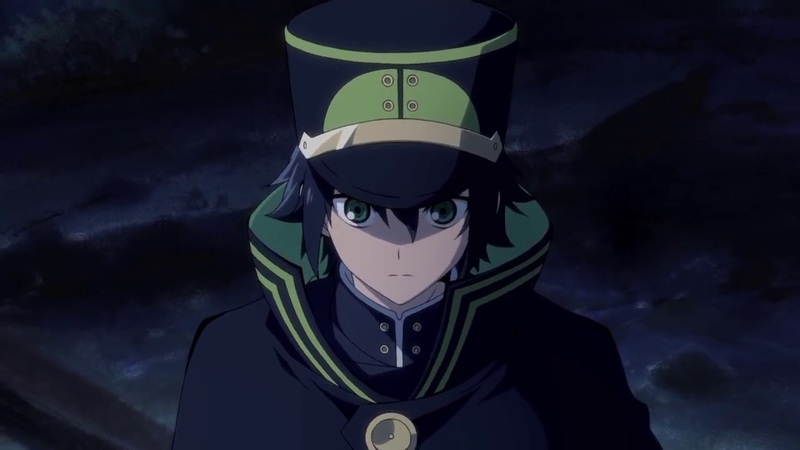 The trailer itself features the opening song COLORS by Flow, while showcasing scenes from the series – all of which can be viewed in High Definition. Code Geass – The Complete 1st Season will be available on Blu-ray & DVD from the 21st of January 2013. The second Blu-ray release this month is Journey to Agartha, or more commonly known as Children who Chase Lost Voices and it is the first full length animated feature film from Makoto Shinkai, who previously worked on 5 Centimeters Per Second. This film will be available on Blu-ray, DVD and a Special ‘Collectors Edition’ Combo Pack, which features both Blu-ray & DVD versions of the film as well as some special extras, however the UK Release (as standard) will include Interviews, The Making of, Japanese Promo Video and Japanese Teasers. Jorney to Agartha will be available on Blu-ray, DVD & Collectors Edition Combo Pack from the 28th January 2013.